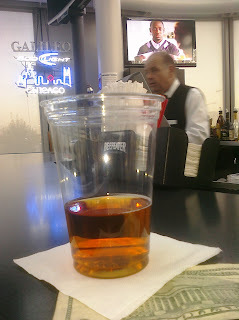 Had to walk the length of the "B" Concourse to find a bar with with a seat. As it turns out - fortuitous. Found Lou's corner bar and the friendliest bartender in the airport. Sam Adams in the glass. Halliday with a no-no through 7 for the Phillies on the screen.